This highly popular medicinal mushroom is one of the most potent in terms of anti-cancer treatment. It is also clinically proven to help patients undergoing radiotherapy and chemotherapy treatment. 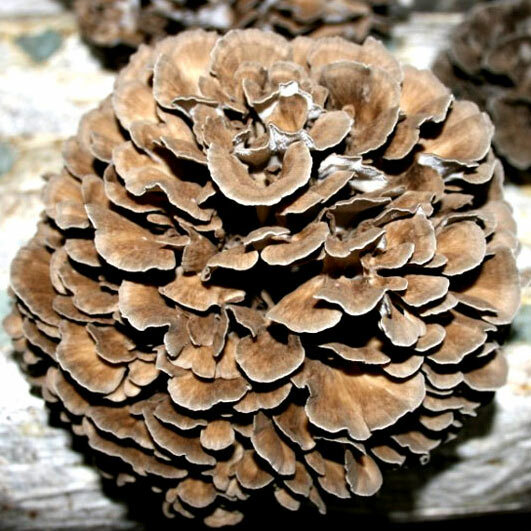 A popular gourmet mushroom, Grifola Frondosa is also a highly regarded clinically, and has shown potential for helping in some forms of cancer therapy. As with other major medicinal mushrooms which exhibit anti-cancer properties, such as Lentinus edodes (Shiitake) and Trametes Versicolor (Coriolus Versicolor), its high polysaccharide content has been shown to be its major active compounds, along with several beta-glucan, heteropolysaccharide and proteoglycan fractions - which all exhibit potent immune system enhancing action. Traditional Japanese medicine used the mushroom to treat high blood pressure and elevate the immune system. It was also used to promote heart health by lowering cholesterol levels. The mushroom is purported to help people lose weight when used as part of a diet and exercise program. Weight loss is thought to occur because the mushroom may prevent some fat cells from increasing in size. Ancient Chinese medicine used the mushroom to treat arthritis and nerve pain. The mushroom was reported to have beneficial effects for those that have palsy. Some stomach ailments were treated with an extract of the Grifola Frondosa. It was also used successfully to calm the mind and nerves.